Moriche Palm - ARTE AMAZONIA provides a global voice through art for the indigenous cultures of the Amazon. The Moriche Palm, Mauritia flexuosa, also known as the Ité Palm, Ita, Buriti, is a palm tree. It grows in and near swamps and other wet areas in tropical South America. It is an elegant tree which can reach up to 35 metres in height. The large leaves form a rounded crown. The Moriche Palm fruit is edible (called aguaje in Peru), has a high vitamin C content, and used to make juice, jam, ice cream, and a fermented "wine". An oil high in vitamin A is extracted from the pulp and is frequently used to treat burns because of its soothing qualities. 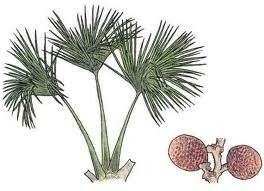 The inflorescence buds are eaten as a vegetable, and the sap can be drunk fresh or fermented (see palm wine). Threads and cords are locally produced from the tree's fibers. It is often used for making handicrafts including baskets and hammocks. 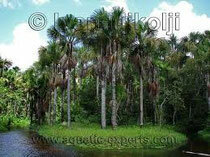 Buriti oil is an orange-reddish oil extracted from the fruit of the Moriche palm. The oil contains high concentrations of oleic acid, tocopherols and carotenoids, especially betacarotene. Recently it has been found to filter and absorb cancer-causing UV rays from the sun.